College is often hard to imagine for many of metro Richmond’s young people. Many students in our city’s neighborhoods come from families that have no experience of a college education, with many parents often wrestling with the lack the tools or resources needed to guide their children toward a university. Boys & Girls Clubs of Metro Richmond is working tirelessly to change this reality. All Clubs throughout the area focus on college readiness through a variety of programs, whether it’s mentoring relationships, college tours, team-building exercises, leadership development, or straightforward college course prep. The MLK, Jr. Middle School Club has a particular focus on preparing students for liberal arts educations, says Delbria Walton, senior program director for Clubs in Richmond’s East End. Some of those tools at MLK include a chess club, where students learn to play and compete with one another. There’s also a sign-language group, taught by an energetic instructor who motivates young women to work together, communicate well and practice community service. College tours are typically part of the college readiness repertoire, but the MLK staff began to feel that many of those visits fell short. Standard college tours didn’t seem to meet the students where they were. Most college tours are organized for students who are already primed to see themselves at college, kids who already have a context and an imagination for what campus life might be like. Many students in Richmond’s East End don’t share that context. Ben Teese, a program director at the MLK, Jr. Middle School Club, felt like there had to be a better way to introduce students to a four-year university experience. With the help of his fellow staff, he began to dream up an creative day for students at the University of Virginia, where he had recently been accepted to the Frank Batten School of Leadership and Public Policy to pursue a Master of Public Policy degree. After several months of intensive planning, nine middle-school students from the MLK Club traveled to Charlottesville to visit the University of Virginia and get a taste for what college life might really be like. Club members with staff member Ben Teese at the University of Virginia. The group started off with a tour of Grounds, and instead of taking the typical tour of imposing academic buildings, the kids visited the main landmarks around campus. They were led by a young African-American man who served as their tour guide. When they paused on the South Lawn, opposite the Rotunda, he began to tell them about Thomas Jefferson and the university’s history. Club members taking a tour led by a current UVA student. “When the university opened, it was intended for the sons of white plantation owners and slave-holders,” he said. “That’s the history behind this place, but I am here now, so obviously things have changed. This is a place where we can all go.” Ben said it was a powerful moment, and he could see the effect this statement had on the students. UVA student Pobo Ekeforo speaks to students at the Frank Batten School of Leadership and Public Policy. From there, the group had lunch with several UVA students and then visited the Batten School, where they met Pobo Ekeforo, a student in the first-year accelerated master’s program at Batten. Pobo, a chess champion and athlete in shotput on the UVA track team, talked to the students about his background. He grew up in Section 8 housing with his mother, a single mom, which was an experience that resonated with many of the students. Playing chess with Pobo on the Lawn. Upon hearing about Pobo’s prowess in chess, one of the students who participated in the MLK Chess Club began to playfully trash-talk Pobo, saying he probably could beat him in chess. Pobo was up for the challenge and went back to his dorm room to get his chess board. Pobo happened to defeat him handily — but gave him great encouragement and was impressed by all the student had learned. Hanging out with some UVA basketball players in the McIntire Amphitheatre. As they wandered through Grounds, the MLK group paused in the McIntire Amphitheatre, a large grassy area where university students were playing lawn games. The MLK students jumped in right away. Ben says that he turned his head, and the next thing he knew, the kids were running down the hill to join into the games. They happened to start playing with some UVA basketball players, who happily agreed to have their photos taken with the group. Learning from Batten Professor Sophie Trawalter in a private lecture on diversity. The group returned to the Batten School to enjoy a private lecture from Professor Sophie Trawalter, associate professor of public policy and psychology. 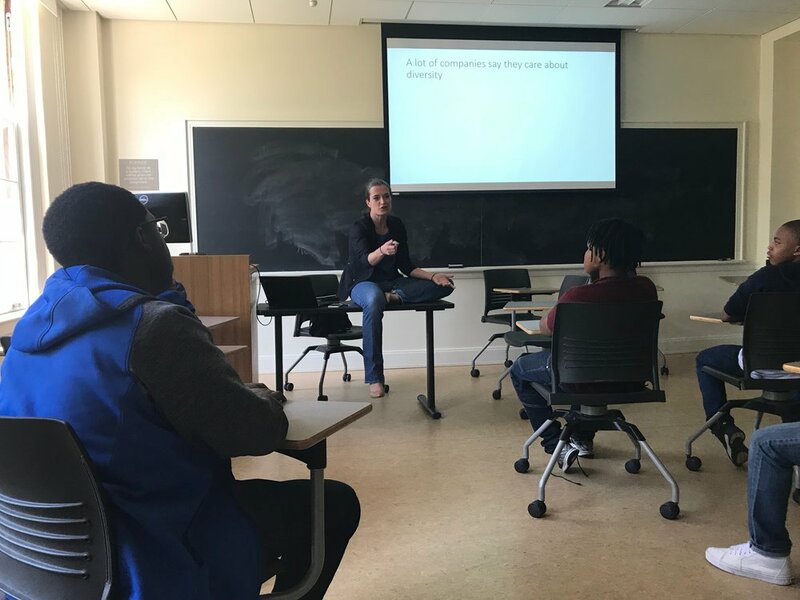 Professor Trawalter lectured on social diversity, explaining how her research shows the ways that different people from different backgrounds can interact in particular contexts. After all of these activities, the day ended peacefully with some field games on the University of Virginia Lawn. “I wanted them to be comfortable in this space and not just feel like they were window shopping. I wanted the students to feel like the Lawn was a place they could be safe, have fun and feel secure, so that when they think about going to college, they may have more motivation and inspiration,” Ben says. For these nine young people, the curtain had been pulled back on higher education. A four-year university was no longer some unimaginable, foreign place, but a place they could see themselves. As the day drew to a close, several of the Club members told Ben that they wanted to go to UVA now. Their imaginations had been sparked, and they were ready to fully own a college-ready future.